Read R. J. Wakeman's in depth history of Brunswick's phonograph business. The interactive book will open in a new window. 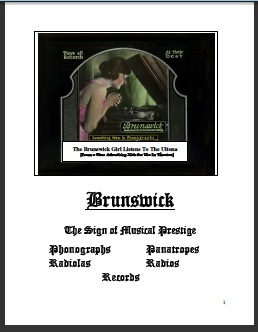 Brunswick is unique among the famous manufacturers of phonographs from a century ago in that the company is still in business, although no longer in the entertainment field. Today, they are known as Brunswick Corporation, but when they were manufacturing phonographs and records, they were the Brunswick-Balke-Collender Company. At the time that company entered the phonograph business, they were also manufacturing bar fixtures, billiard tables, balls and cues, bowling balls and equipment, piano cases, church furniture, toilet seats and interior wood trim for commercial businesses. The company was expert at woodwork and approached the major phonograph manufacturers to see if any would be interested in having Brunswick bid for their cabinet business. Edison became their biggest customer, but even with large cabinet orders with Edison (such as this early 1916 order noted below), the company's leaders thought they could do even better by making and selling complete phonographs. There has been some speculation that Brunswick was forced to enter the phonograph market after Edison cancelled the order noted above or refused delivery of some cabinets and left Brunswick with an inventory of empty cases, however this is not supported by any evidence and is counter to the official Brunswick history. R. J. Wakeman has written a comprehensive history of Brunswick's phonograph business and has generously allowed it to be read here. For anyone interested in the history of the company, this book is a treasure trove of information. In addition to the historical information, photos of nearly all the Brunswick models are provided. For a more detailed look at various Brunswick styles, use the navigation menu at the top of the page.